These days, it seems like everyone has their own specific philosophy when it comes to carbohydrates. Some fear them and encourage others to avoid them like the plague. Some put limits on carbs, telling you to only consume them until 3 in the afternoon or to limit carbs in the evening. With all this mixed information, is it possible to learn the truth about carbs? When you are trying to get fit fast and shed body fat, it is crucial to eliminate any pre-conceived notions about carbs. Carbohydrates are, in reality, essential elements in every smart body builder’s diet. However, they must be consumed correctly in order to be beneficial to your fat loss plan. Before we discuss why carbs are an important part of YOUR FAT LOSS DIET you need to be aware of the three specific types of carbohydrates. Simple– Often found in foods like fruit, candy, and sports drinks, simple carbohydrates are comprised of short chains of sugars that are quickly broken down when they enter the body. Simple carbs provide short bursts of energy that do not last for very long. Complex– Foods like bread, rice, oats, potatoes, and pasta contain long chains of sugars called complex carbs. The body takes longer to break down these types of carbs, so they provide you with energy for longer periods of time than simple carbs do. Fibrous– Green and leafy vegetables, fruit skin, and broccoli are often called ‘roughage.’ These items have fibrous carbs in them. These types of carbs help you feel full much longer than other carbs because the body takes them longer to digest. Why Are We Afraid of Consuming Carbs? It makes me so confused when people say “I do not eat any carbs” huh? How do you survive and thrive?? It just does not make sense to live that way and is such a broad statement. When you eat carbohydrates, the body breaks them down into a substance called glucose. As glucose enters your blood, a hormone known as insulin is secreted from your pancreas. Many of us fear this process when eating simple carbs because the level of insulin in the body shoots up quickly and then drops just as fast. This causes the body to crave more and more carbohydrates which can lead to a vicious cycle of binge eating. For most us, the words “binge eating” are the most deadly, so, in our minds we often say, “Carbs are bad. They lead to ruin. I’ll avoid them,” and we hardly give it another thought. But wait…before you banish carbs forever, keep reading. One gram of carbohydrates contains four calories, making them a low calorie food that can easily fit into your diet. However, the trouble comes when large portions are combined with the insulin induced carb cravings. This combination can result in a seemingly never-ending cycle of eating more and more simple carbohydrates. Because of these problems, many individuals consider carbs to be the enemy of any fat loss program. This couldn’t be further from the truth, however. When you remove carbs from your diet completely, your body suffers. Your body needs the insulin produced from eating carbohydrates to function. Without them, you may experience feelings of lethargy, headaches, and a general fuzzy feeling in your head. So why do no-carb diets work for some? Actually, they don’t. Carbs hold water in the body. When they are eliminated from the diet, the weight lost is water weight which quickly returns once the dieter begins to consume carbs again. It is also pretty much impossible to maintain a no carb diet for very long, so it is not a real solution if you want to get lean and stay lean. Now that you understand the different types of carbs and why so many individuals are afraid of them, we need to discuss the impact of carbs on your fitness routine. Provide you with the strength and energy you need to power through the toughest workouts– When you are working out and trying to lose weight, you need all of the strength and energy you can get to perform at your best. Complex carbohydrates provide you with that needed zap of energy for intense physical workouts. These types of carbs also take longer to convert to glucose in the body, which means your blood sugar and energy levels will stay more consistent throughout your workout. Replenish the stored carbohydrates in your muscles after a workout- Your muscles can not work without contracting, and this requires the right fuel. This fuel is known as ATP, or adenosine triphosphate. This fuel is what allows you to run, toss a ball, or jump over an object. Once this energy source has been used, however, it becomes what is known as adenosine diphosphate, or ADP. ADP can turn into ATP easily, but this recycling process requires glucose. As we discussed previously, carbohydrates are broken down into glucose when they enter the body. Therefore, eating carbs after your workout routine can provide your body with the energy source it need to turn ADP into ATP and keep your muscles functioning well. While carbs are a necessary element in a good diet, many individuals become confused about what specific carbs to eat. And this is understandable. Eaten incorrectly, carbohydrates can be havoc on a diet and produce negative fitness results. The secret to keeping carbs in your diet involves which carbs you eat, when you eat them, and how much you consume. Which– Avoid man-made or processed carbs like sugar cereal, potato chips, energy bars, enriched white bread, and candy. Instead rely on a good variety of natural complex carbs like brown rice, sweet potatoes, quinoa, otameal and whole grains. The problems occur when people pile on salt ,sugar, butter to these natural foods. Try some salsa on your potatoes or some fresh fruit and raw nuts in your oatmeal. Fibrous carbs found in roughage can keep your digestive system running smoothly and have a negligible effect on blood sugars, so these are essential as well. When– Fibrous carbs can be eaten at any time of the day and in abundance, but the majority of your complex carbs should be reserved for right before and after your work outs and the first part of your day. How Much– Take care to limit the portion sizes you consume when eating carbs. Make sure they are appropriate. Look at serving sizes of food you will be surprised what is appropriate and how out of control most people eat. Eating large portions can have a negative effect on the body because there is only so much room for glucose in your body’s muscles. When the muscles are unable to house any more glucose for the ATP, the remaining carbs are turned into fat and stored in fat cells. If you are trying to lose weight and get fit fast, don’t eliminate carbs from your diet. Carbohydrates are a much needed element that, when consumed correctly, can produce great fitness results by providing you with the energy you need to work out and lose weight quickly. 1. Chop all vegetables evenly. 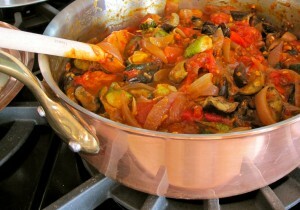 In a large saucepan, add a little olive oil and then start cooking the sweet potatoes, carrots, and onions over medium. Throw in the celery and two cloves of garlic. 2. Add the rest of ingredients, pop on a lid and let cook for as long as desired (depending if you like your veggies crunchy or soft). Near the end of the cooking time, add the tomato paste (already mixed with 1 cup water) and stir in, cooking for a few more minutes. 3. Sprinkle with cilantro and serve. Previous Teach your Kids Tuesday – what my kids will & won’t eat! Next The Importance of Rest: Take Care of yourself Thursday!